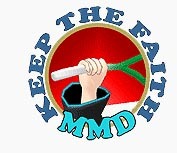 We in the MMD Community rely upon the artistic talents of a great many creative people. Their work is to be appreciated and treasured. It’s not “grab and go”, it’s “help yourself and say thank you.” Give proper credits; share responsibly. MikuDance.info - A Very Useful Site for MMDers! Is there a MMD Terms of Service anywhere? I can’t find it. Officially, such thing does not exist.